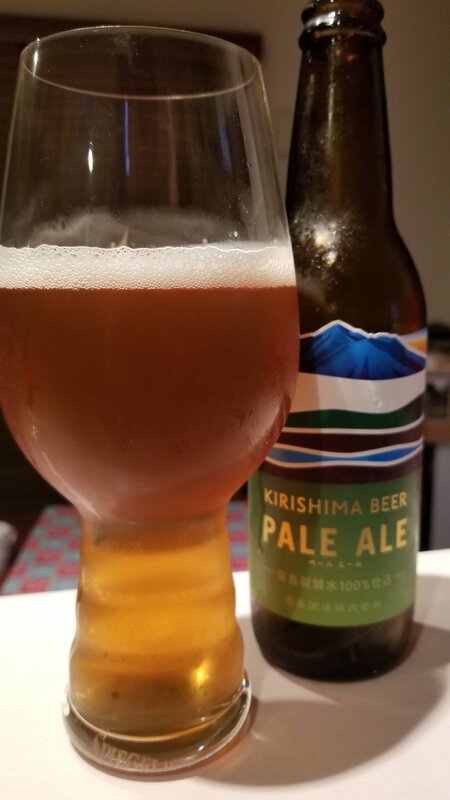 Kirishima Pale Ale is a 5% American Pale Ale from Kirishima Beer, based in Miyazaki, Japan. It’s part of their all-year round range of beer and can be found in bottles, though we’re yet to come across it on tap on our travels. It has an IBU of 45 though there is no indication of what hops are used in it. Kirishima Pale Ale poured out a clear golden orange color with a thin ring of white head on top. It had an aroma of lemon with grapefruit and a slight hint of pine to it as well. The malt brought a subtle biscuity nose to it that was quite faint even when Kirishima Pale Ale had warmed up. The bitterness to Kirishima Pale Ale was present from the start, but it was neither overpowering nor offensive – just enough to let you know there was some. The hops came through with the same lemon and grapefruit flavour as was in the nose. The carbonation was noticeably on the low side for an American pale ale, which made the malt a bit more pronounced than usual, with a biscuity base getting stronger as Kirishima Pale Ale warmed up. It finished off with a dry citrus finish. Kirishima Pale Ale is middling American Pale Ale – not the best but far from being the worst.